So what if we reversed the influence and started hanging around good company? We would have, “Good company encourages good habits.” The good influence encourages us to become a person of good morals and behavior. It was apparent to all who watched the disciples that they had been associating with Jesus. His influence had colored their lives in an undeniable way. After three years of association with the Son of God, His characteristics had rubbed off on them. After reading through the book of Acts, I found at least fifty characteristics and experiences revealed through the lives of the early Christians. I won’t list all of them, but each one proved that they had been with Jesus. No other influence could have inspired them. No other cause could have brought about the supernatural in their lives if it hadn’t been for the presence of Jesus. Jesus promoted unity from the very beginning of His ministry. He always encouraged love to tie them together, but also set an example of unity between Him and His Father. This revelation enabled the disciples in the book of Acts to influence their world in a powerful way. Jesus showed the disciples how to flow in the supernatural as He walked on the earth. Though He was right there with them, they didn’t sit idly by, waiting for Him to act. They followed His example, right through the book of Acts. Jesus taught His disciples to be like the Father, showing mercy and compassion on those who needed it. Learning from the best, the disciples made it their lifestyle to care for the poor and each other as the opportunity arose. Jesus set an excellent example of a person who faithfully prays. Prayer was His lifeline to God as He sought direction for His ministry. The disciples also caught its importance in their daily lives. As a result, power filled their lives to enable them to do what God had called them to do. No one portrayed obedience better than Jesus. Even in the most trying of times, He submitted Himself to the will of His Father. The disciples, under heavy persecution, followed that example. They obeyed, even when it hurt. Jesus wasn’t a coward. It didn’t bother Him that His actions might cause people to dislike Him, or even to stir up violence. He did what He was called to do, no matter the cost. The disciples, filled with the Holy Spirit, also operated in that boldness as they preached God’s Word. Jesus called all to repent from their sin, to set their lives totally apart for Him. The disciples responded to this message, repented themselves, and urged others to do the same. A life of purity was what they called for as they honored Jesus. Jesus knew the importance of praise, and led His disciples to put it into action. The disciples caught its value and put it into practice, even in the middle of heavy persecution. 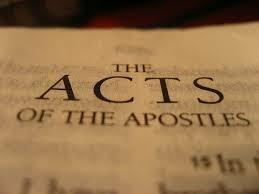 In cases such as Paul and Silas, this action of faith caused freedom to arrive (Acts 16:16-40). We could never get any closer to “good company” than Jesus. He, the perfect Lamb of God, gave us the greatest example of integrity we would ever need. He showed us how to live as successful, world-changing disciples. He gave us all the tools we need to represent Himself and the Kingdom of God as we were always commissioned to do. The question is this: Who will be our greatest influence? Who will we associate with the most so that they’re attributes become our own? We can bow our knee to the world, following after their corrupt company; or we can surrender to Jesus and cause the world to marvel. The choice is ours.